Along with a greeting card sample pack, Red River Paper also sent me a fine art sample kit and a variety of larger paper sizes to try out. During the course of my Epson P800 review, I tested out the papers that Red River sent me and came away very impressed. Featuring expert input from Red River Paper's Drew Hendrix. Inkjet printer users have long sought paper with a sturdy weight and feel. Heavy paper communicates a sense of value and artistic importance.To meet this need, Red River Paper recently introduced 88lb. Polar Matte Magnum Card Stock. At 19 mil thickness, the new paper is the heaviest and thickest photo matte paper on the market today. San Gabriel Baryta SemiGloss 2.0 brings back the look of traditional fiber prints from the heyday of chemical darkrooms. The paper has a lightly textured surface,which adds depth, distinction, and an elegant reflectivity to the finished print. San Gabriel Baryta SemiGloss 2.0 has a pleasant warm tone that adds natural richness to portraits and landscapes. 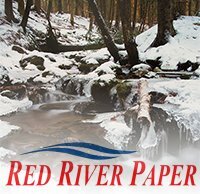 One of my favorite companies, Red River offers a potpourri of papers, from inexpensive RC and matte photo papers to recycled and specialty papers. Their Aurora fine art paper is gorgeous and reasonably priced. It’s definitely worth purchasing a sample pack and playing with the different types. "...Their papers produce excellent results on almost any printer." "Red River Paper is outstanding when used in today's new photo printers." "Red River Paper...produced spectacular results...and did an excellent job of holding color and detail." Featured in the November 2002 issue of Shutterbug Magazine as an Editor's Pick for Top Photo Tools of 2002.